Discussions of money, technology and financial inclusion focus largely on practices around using and saving money. In our work we take a step back and analyze how money is earned in the first place, and how technology is woven into people’s livelihood strategies. With this objective in mind, we studied the use of mobile phones among fishing communities in Kerala, India. We first encountered our field site through a study that has become canonical in ICTD: economist Robert Jensen’s study of mobile phone use in fishing markets in north Kerala. Very simply put, Jensen found that the use of mobile phones to share market price information made fish markets more efficient while also improving producer and consumer welfare. Our goal with this project was to understand the geographic and political economic conditions in which Jensen’s findings hold and to examine questions of generalizability. In addition, we wanted to expand definitions of welfare to encompass more than an increase in income or savings. Fish trade in north Kerala is a special case. The region’s geography as well as prevalent investment and credit relationships allowed fishers the flexibility to sell at different markets. In south Kerala, we found that all-season landing centers were farther apart than in the north. Further, boats were bound by a credit relationship to a single investor rather than to several investors as in the north. For these reasons, fishers in the south had less flexibility to sell in different markets. Moreover, in both regions, only specific categories of actors within a landing center found price information critical in making trading decisions and regularly used phones to ascertain it. A majority of those at the fish market were using mobile phones in a much wider range of activities related to their livelihoods. While a majority of these individuals perceived mobile phones as having enhanced their livelihoods and well-being, their implicit definitions of ‘welfare’ were rarely focused on improved incomes alone, emphasizing instead how they used their phones to maintain relations within and outside the market, and protected themselves during times of risk, vulnerability, or emergency. Describing our first and second conclusions, and the list of differences between fishing in north and south Kerala, is beyond the scope of a short blog post such as this one. Therefore, we focus here on our third and fourth conclusions. We discuss the varied uses of phones and the many definitions of welfare that were emphasized by different actors in the fishing industry. Based on our observations, we argue that the seeking of market price information via mobile phones should not be given an over-privileged role. At the time Jensen conducted his research (1997-2002), phones cost Rs. 5000 (around $106) on average, and there was a clear division between those who possessed phones and those who did not. By the time we conducted our study (2012), phones could be purchased for as little as Rs. 700 (around $15) and many owned multiple phones. No boat went out to sea without a phone and most typically had multiple handsets onboard. Nor was this restricted to fishers: an auctioneer told us “There’s no business here without mobiles” and we heard this from almost all categories of actors operating in both north and south Kerala sites. Jensen’s focus on who possessed phones and who did not is therefore less significant today than it was during his study. The more interesting question today is how phones are being used by different categories of users. In addition, we saw that other technologies such as GPS and echo sounders have become popular since Jensen’s study, making it worth asking how phones are being used in conjunction with these technologies. Among the broader uses of the mobile phone, co-ordination work between the different actors in the fish economy constituted an important category of uses. This was important in fish marketing activities, as well as in fish preservation. Boat owners and fishing crew described, and we saw, how they would call their auctioneers a few minutes before they arrived at the shore to ensure someone was on hand to perform the auctions. Fishers in the south also mentioned discussing the timing (rather than site) of landing to optimize pricing. The ice-seller on the shore called the ice company to order ice based on how much fish was being transacted on a given day. Wholesale merchants and export agents also mentioned using the phone to communicate details of the trucks on which they were sending fish to agents at the destination. The perishability of fish, of course, was part of what made this coordination work critical. Phones were also mentioned in the context of coordinating or balancing work and home concerns, most often by women vendors who operated in south Kerala. With the growth of fish exports, the presence of export company agents on the beach and the entry of cheaper fish from neighboring Tamilnadu, small-scale vendors are increasingly being marginalized in this region. Many small-scale vendors in this region have started traveling to markets in Tamilnadu to buy cheaper fish. Women comprise a part of this population that travels long distances everyday to purchase fish. A woman vendor’s work day, which includes traveling by public or hired transport because she doesn't own a vehicle, attending an auction, purchasing fish and selling it at a market or at individual houses, can last longer than 12 hours. Since women are also seen as the caretakers of this family in the prevalently patriarchal structure of the region, they worry about their families and their children throughout the day that they spend away from home. Many of them mentioned that having a phone helped them inform their family of their schedules and delays, know what was going on at home, and relieved them of constant worry. Just as frequently as coordination work, people on the ground mentioned fish-finding as a prime reason for using mobile phones. Fishers used phones at sea and on shore to gauge fishing grounds on a given day. We found, in addition, that phones were often used in conjunction with the Garmin GPS units that all fishing units carried. The GPS was used to mark and specify the exact location where fish had been found. Fishers both used these markers themselves at a later date to look for fish, and also shared them with friends and relatives, a practice also noted by Abraham and Sreekumar. The widespread use of GPS and echo sounder technologies to pinpoint the location of fish and the use of GPS coordinates to share such prime fishing locations with other fishers post-dates Jensen’s study and is another element of the changing industry. While the sharing of fish locations is limited to fishers’ close social networks, it is worth noting that Jensen dismisses the likelihood of such a practice existing at all and as being against fishers’ self interest. Using examples from north and south Kerala, we outlined six primary uses of the mobile phone – (1) price information gathering in combination with (2) arbitrage work (as considered by Jensen), as well as (3) coordination work, (4) balancing work and family (5) fish-finding, and (6) emergency response. We did this to question the often singular attention placed on the first two, and the pithy statement that commonly circulates in the aid sector and the mass media that ‘farmers/fishermen use mobile phones to get a better prices for their goods.’ What we heard from fishing industry actors in the field in both north and south Kerala is that there is no single practice that prevails as the most significant or universally valued use of the phone. It is important here, we argue, not to mistake the focus and priorities of disciplines (such as the concern in economics for how information asymmetries affect market functioning) for the interests and priorities of target populations. There are opportunities in the ICTD space (perhaps underexplored) to support the underlying needs that these alternate practices reflect. The varied uses of the phone among these actors are matched by almost as many understandings of ‘welfare’ in their lives. People did not define their well-being or welfare primarily in terms of their income, or in terms of optimizing it. Many of them, especially the owners and crew of vallam and gillnet boats, and small-scale vendors, spoke instead in terms of managing or coping. They spoke of their physical and mental well-being, sometimes prioritizing that over an increased income (such as fishers who spoke of wanting to sell quickly and move on to rest, rather than wait to get the best price). The survival of a fishing unit lost at sea or caught in a storm is, of course, critical to fishers’ own long-term welfare and that of their families. Fishers and others in the fishing supply chain spoke also in terms of maintaining relationships, with fellow fishers, their auctioneers, or regular buyers, rather than solely in terms of optimizing their incomes (as reflected in practices of sharing fish-finding locations). These practices may very well eventually lead to improved incomes, but in a longer term and less easily measurable way. They also lead us to ask if Jensen’s definition of the fisherman’s problem as "maximizing profits by choosing where to sell their fish" or concluding with income increases as "welfare benefits" doesn’t narrow our understanding of the reality of the fish market. The broader implication of our work, which we are only able to flag in this post (but is available in more detail here), concerns the importance of situating analyses of technology use in the history and political economy of a region and a sector. 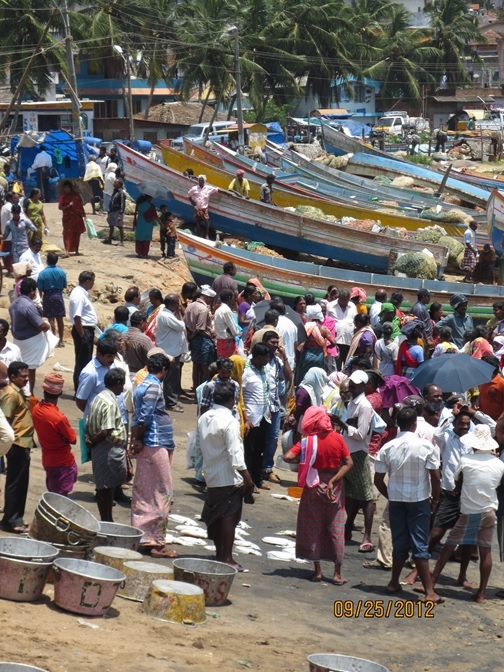 Through our conversations and examination of archival material, we found that fish markets in Kerala have been shaped by the regulatory influences of both fishers’ collectives and the government, in particular the creation of fishers’ co-operative societies, the systematization of an auctioning system and the loosening of traditionally coercive credit relations between fishers and those who provided them capital to purchase and operate their fishing craft and gear. We suggest that when studies (such as Jensen’s) omit these features in order to create parsimonious models and explanations, we end up representing particular markets as more “free” than is warranted. In turn, this potentially blinds us to the power dynamics that shape the daily working of such a market, including who uses technology and towards what end.